For kindergartners and children of other grade levels we offer a participatory program consisting of three parts and lasting between 60 and 90 minutes. During the first part of the program children are made familiar with a wide range of topics in “Heinrich Hoffmann and his Famous Picture Book” in a manner that is age-appropriate. 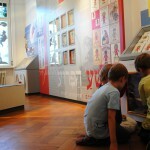 In this section of the tour children learn how the Struwwelpeter came to be written, as well as about the backgrounds of the different stories. Together with their tour guide the children scrutinize the stories and make connections between them and the experiences of children today. For a long time the Struwwelpeter stories have been criticized harshly by parents and educators, who have called the book both “authoritarian” and “cruel.” In the museum’s ongoing dialogue with visiting children, however, one particular quality of this children’s literature classic arises regularly: the book gives children the chance to approach and think about a broad spectrum of experiences in their own lives, from arguments at the dinner table, to daydreaming. After a brief break, during which the kids try their hands at various games inspired by themes discussed, the second part of the tour begins with a trip through the exhibit which has a special “Kid’s Level” with hands-on-toys and funny pictures to explore. The children are shown original works of Heinrich Hoffmann, rare editions, imitations, translations, kitsch, and artworks that document the great success of the Struwwelpeter. 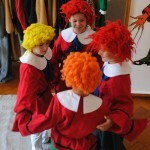 In the third part of the tour the children may reenact and reinterpret the Struwwelpeter stories using the various costumes, masks, and props in the museum’s playroom. Whether or not a story should end as it does in the book is entirely up to the children performing it. Children incorporate their everyday experiences and perform with varying amounts of intensity in these impromptu shows. A child may portray Struwwelpeter as a way to express resistance against authority, or Nasty Friedrich to show his or her aggression, or the child could perform the “Hunter and the Hare” story to show a hilarious and wild upsetting of the power structure. Visit our great Puppet theater performances on Mondays (4-7 years; see program). Struwwelpeter and Hampelmann punch-out sheets are available at the museum’s register for 0,50 €. Please notify us at least two weeks before your visit in order to reserve a tour time. The Palmengarten and Senckenberg Natural History Museum are located very close to the Struwwelpeter-Museum. In the summertime the Struwwelpeter-Museum also offers picnics for children’s tour groups out by the Grüneburg Park playground.